Maria Ferrera (standing center) welcomed all the guests during the Report Back including (left tor right): Rebekah Lomahan, Shirley Pintado and Vivian Santiago. 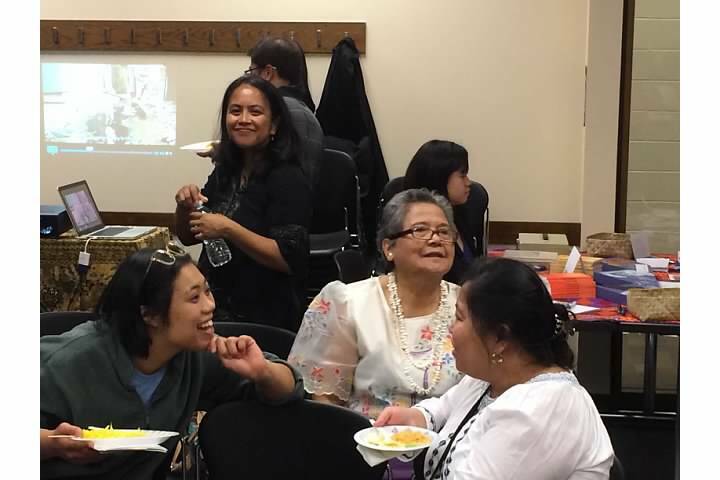 In July 2015, the Bayanihan Foundation enabled a new generation of Filipino Americans to “return” to the Philippines for the first time. 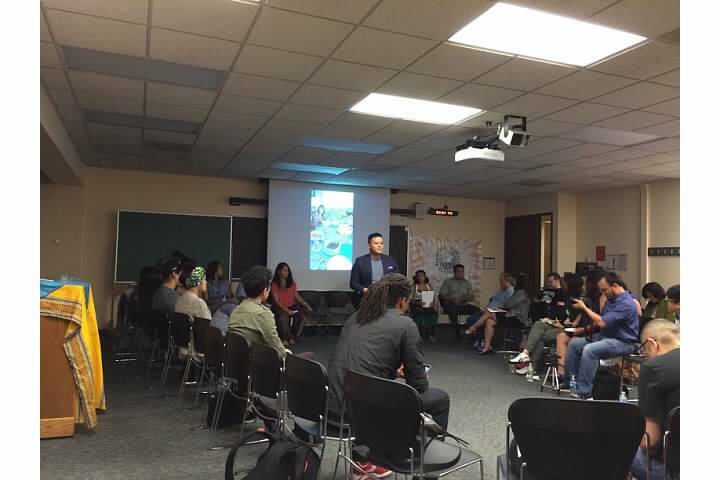 On August 29, 2015, Bayanihan Foundation board member Dr. Maria Ferrera of DePaul University welcomed everyone to the Report Back event where participants from Kaluluwa Kolectivo and NEXTGEN shared their stories and experiences during their journey. 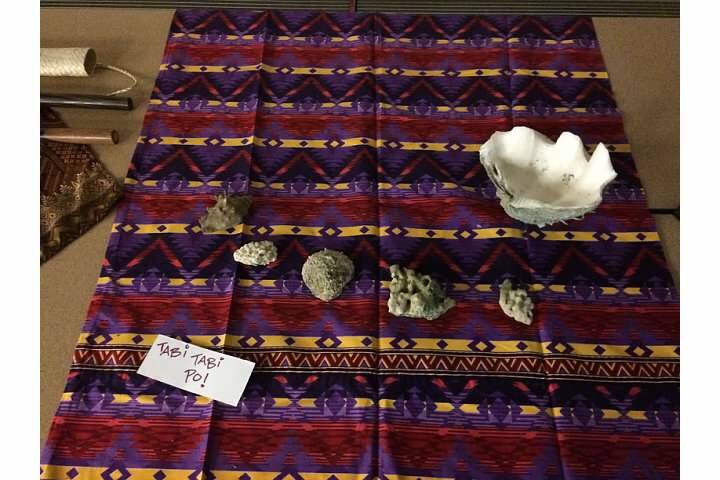 The seven participants were: 1) E Armea; 2) Jane Baron; 3) Marc Butiong; 4) Stephanie Camba; 5) Crystle Dino; 6) Irene Juaniza; and 7) Jeselle Santiago. Salamat po! (thank you). I also shared a heartfelt thanks to all the Foundation’s supporters and friends that made this project possible. 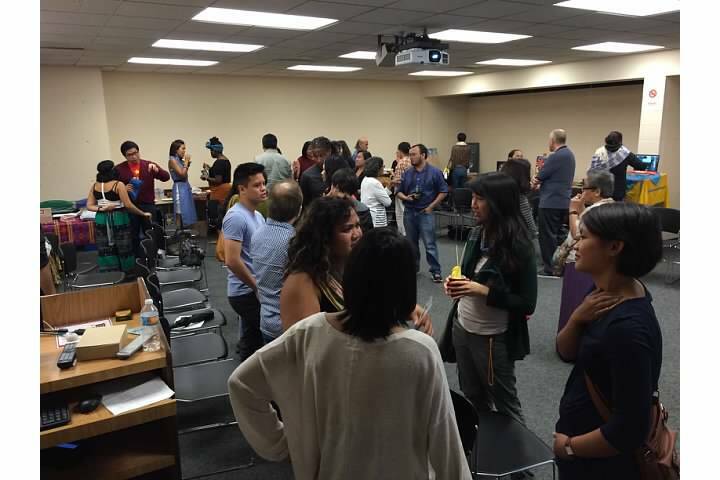 NEXTGEN Fellow Marc Butiong moderated the event and my Mom, Shirley Pintado, prepared all the refreshments and food that was served. Board member James Castillo also shared his reflections during the trip. Board member Ted Kirpach encouraged the audience to donate and continue to support the Bayanihan Foundation through its Indiegogo crowd fundraising campaign “Change A World, Change The World“: http://igg.me/at/bayanihan The participants shared their heartfelt reflection of the trip and how their visit of “returning” for the first time affected them. 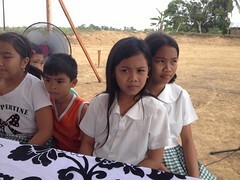 Finally, maraming salamat po – thank you – to all the Bayanihan Foundation donors and supporters around the world. This entry was posted in Diaspora Giving, Philippines, Uncategorized, Youth leadership development and tagged Philippine giving, Philippines, youth leadership development. Bookmark the permalink.